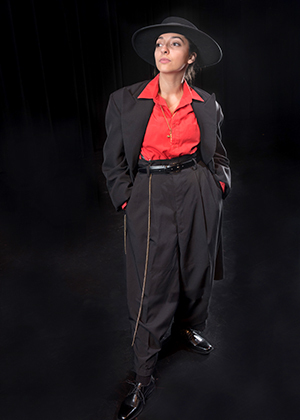 When Zoot Suit premiered at the Mark Taper Forum in Los Angeles in 1978, it was more than just an instant success. As former Los Angeles Times theater critic Sylvie Drake recently observed, "it exploded on the stage with the force of a sociopolitical A-bomb." Playing to standing-room-only crowds, it ran for a year before moving to New York to become the first play on Broadway written by a Chicano author. It was soon adapted into a feature film starring Edward James Olmos and Tyne Daly in 1981. The result was a wave of incidents of violence against Latinos and other minorities in LA and cities across the country, which became known as the Zoot Suit Riots. Four decades after its premiere, Valdez has created a new version of the play, which just opened in February on that original Los Angeles stage. And on May 26-June 4, UC Santa Cruz will become the first academic theater to produce the new script. 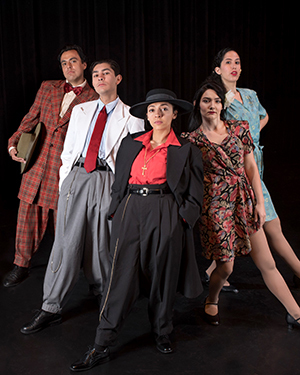 "The social factors that made Zoot Suit so relevant to audiences in 1978 give the play a fresh significance for audiences in 2017," said Michael Chemers, associate professor of theater arts at UC Santa Cruz. 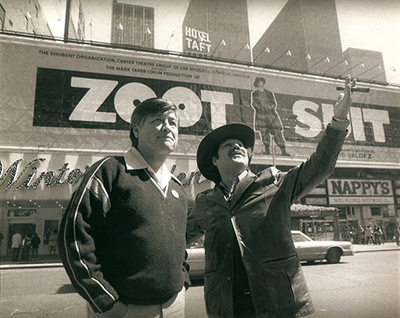 "Zoot Suit in 1978 was a rebuke to mainstream American culture for its lingering refusal to allow Mexican-Americans to participate in the American Dream, as much as it was a celebration of a different vision of what it meant to be American--a vision as uniquely and authentically American as those represented in the plays of Eugene O'Neill, Tennessee Williams, Arthur Miller, Lilian Hellman and Tony Kushner--but one that even in 1978 remained barely recognized as American at all." 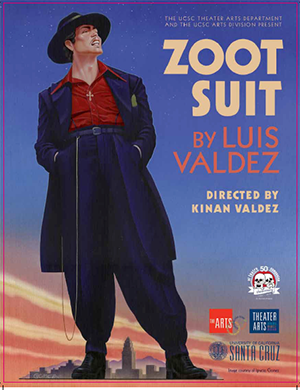 The UC Santa Cruz production of Zoot Suit will be directed by the son of the playwright, Kinan Valdez. The family and its theater company, El Teatro Campesino, have been associated with the campus since the early 1970’s, when Luis began teaching Chicano theater classes. "The connection between El Teatro Campesino and UCSC was forged by theater arts professor Jim Bierman and several members of the company have taught at UCSC," said Chemers. "Jim also collaborated with ETC on a 1999 CD-ROM called El Teatro Campesino: From the Fields to Hollywood. Over the years the connection has deepened. Now Kinan has taken his dad’s place teaching Chicano Theatre classes at least once every other year." "Our students regularly participate in El Teatro Campesino productions--some have gotten quite involved and become staple members of the company for periods of time," Chemers noted. "Kinan also regularly directs plays in our program, most recently Mummified Deer in 2012." Chemers added that the Los Angeles performances of the revised play earlier this year have already generated a tremendous response from 2017 audiences. "The play was a smash, sold out for three extensions into early April,” said Chemers. “Audiences might have come expecting a nostalgic experience, to revel in the kitsch of a beloved piece of culture from their youth, but that is not exactly what the revival delivered." "Undoubtedly the openly racist, unapologetically divisive, and even gleefully hateful rhetoric that dominated the 2016 U.S. presidential election has spurred a new rise in prejudice, vandalism, and violence directed at ethnic minorities. This plays a cardinal role in how this play is freshly understood." On campus at UC Santa Cruz, Zoot Suit is the result of an extensive collaboration between students, staff, and faculty. Theater Arts majors and minors, as well as many other students from across the campus, have worked for weeks building and painting scenery, selecting and altering costumes, hanging lighting, creating sound and media, and coordinating rehearsals. "I am proud that our Theater Arts Department is presenting this historic production at such a relevant time," noted UC Santa Cruz arts dean Susan Solt. "The show features an incredible cast of students, including the groundbreaking casting of a female actor in the lead role. We have a long history of pushing boundaries, and continue to do just that with this production," she added. 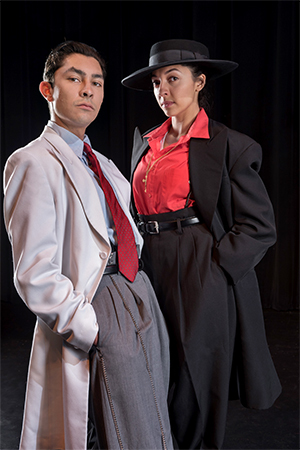 Zoot Suit, directed by Kinan Valdez, is presented by the UC Santa Cruz Theater Arts Department and the Arts Division by special arrangement with El Teatro Campesino, San Juan Bautista. Performances will run from May 26 to June 4 at the Theater Arts Mainstage on the UC Santa Cruz campus. Tickets are on sale now.